Your vinyl car wrap represents you…until it doesn’t. Sometimes you just have to have your wrap removed and it isn’t as simple as ripping off a band-aid. Find out how the wrap professionals will handle a removal job. Removing a wrap yourself is pretty much out of the question because you could easily do some serious damage to your paint job that would end up costing you more than the initial wrap. However, you may have some good reasons for removal, so it may be time to start thinking about a new design. Why Would I Want to Remove My Vinyl Car Wrap? There are several reasons for you to want to remove a vinyl car wrap. The most common reason for removal comes down to your personal tastes. If you are simply tired of your look, we say change it. The key purpose of a color changing wrap is to upgrade your vehicle. So, the choice to remove it in order to make an upgrade is simple. However, proper maintenance is required to make your wrap removal a success. What Makes Wrap Removal Difficult? Even for a professional on the job, wrap removal can become a difficult task. If you haven’t properly maintained your wrap, it can easily become wrinkled, and your local wrap company will have to be extra careful with the way they approach your job. How Does Pricing Work for a Removal? Much like the installation of a vehicle wrap, pricing for vinyl car wrap removal is based on the size and complexity of your original wrap job. Long story, short, if your car is on the large side, it will take more time and labor to get your wrap off professionally and safely. At SkinzWraps, Inc. that is our method of choice. We want you to come back to us to get your car wrapped the way you want it the next time you need a change of scenery. Removal of a car wrap really involves a lot of heat, a lot of experience, and a lot of upper-body strength. However, there is more than one way to skin a wrap. 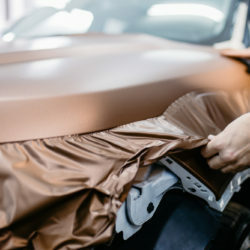 Some wrap removal companies use products like Vinyl-Off to speed up the process while keeping your car’s integrity intact. Your local removal company will be able to help you decide the best route to take. Need a Vinyl Car Wrap Removed, SkinzWraps Can Help! If you know that it is time for a change in your car’s look, don’t go any farther than SkinzWraps, Inc. We have the tools, skills, and experience to make your car look its best and in any unique way that you desire. Get in touch with us today to find out about how we can help make your dream look a reality.